If most genre shows earn devoted followings by creating a unique flavor all their own, then Colony is a gumbo that throws in everything it thinks might taste good. Borrowing tropes, storylines, and even actors from noteworthy series that came before, the new USA series isn’t the most original or inventive program out there. But damn, it’s a lot of fun. The recipe pulls from a multitude of sources. There’s a layer of Falling Skies’ alien-invasion premise, combined with a solid helping of Battlestar Galactica’s limited-resources political maneuvering and white-knuckle escape plans. There’s the “What’s beyond the wall?” mystery that animates shows like Wayward Pines, and a hearty dose of the political allegories that abound in Skies, Battlestar, and Pines. It’s got Sawyer from Lost. It’s got Lori from The Walking Dead. It’s also got Taub from House, if that’s more your style. Everything about Colony feels familiar, even as it strives to create a wholly new world of alien technology and occupied-nation resistance. Perhaps it‘s something about living in a country birthed by throwing off the shackles of an occupying force—combined with the contemporary experience of also knowing life as an occupying force ourselves—that continually makes these narratives resonant. Whatever the reason, the series leans heavily into these themes—and not to its detriment. Colony tells the story of Will and Katie Bowman (Josh Holloway and Sarah Wayne Callies, both delivering strong performances), parents who were separated from their 12-year-old son Charles when aliens arrived one year earlier and took over, erecting massive walls blocking off their section of California from the surrounding world. Now living in occupied Los Angeles with their remaining teenage son and younger daughter, the show opens with Will making a daring secret effort to cross the barrier and find Charles, only to be unintentionally revealed when a resistance group detonates a bomb. Upon his capture, he’s greeted by Proxy Governor of the colony, Snyder (Peter Jacobson), who offers him a choice: Collaborate, root out the underground group resisting the alien-appointed government agents, and Will’s son will be returned to him. Refuse, and be shipped with his family to “The Factory,” a punishment spoken of in mysterious, hushed tones, which indicate that whatever happens there is very bad. Naturally, Will agrees to join the resistance-hunting task force, because he’s not insane, and also because Colony wouldn’t be much of a TV show if he didn’t. The drama pivots on a reveal that is wholly unsurprising, but also ends up paying enormous dividends: Someone close to Will is in league with the resistance, led by the mysterious “Geronimo.” An even stronger hook is Will’s predicament, as Colony quickly works to establish the humanity and liberal good intentions of its collaborationist antagonists. Nobody here is a mustache-twirling villain, with the exception of the Homeland Security grunts who embrace the same militarized supercop mentality that we see shredding people’s trust of police in our own world. (The political metaphors don’t exactly dodge charges of heavy-handedness.) Will’s immediate superior Phyllis (Kathy Baker) reveals herself to be an empathetic and sincere person who thinks she’s doing right by the human race, minimizing violence and terror, even as she manipulates people with ruthless precision. Resistance fighter Broussard (Tory Kittles), meanwhile, has a cold-blooded willingness to kill that throws a wrench into the perception of the insurgency as the noble little guy, and by the halfway point of the season, it’s difficult to say which group harbors the more immediate danger for our protagonists. One of the best tricks the show imports from Battlestar is the continual sense of uncertainty and tension, derived from the fraught nature of trying to do right in a claustrophobic environment imposed by forces outside the characters’ control. Even during the rare quiet moments, such as when Katie re-opens the bar she used to run (a luxury granted by Snyder as a means of trying to pacify and win hearts and minds of the population), the underlying dread remains. At any moment, violence could erupt, from one side or the other, allowing momentum to propel the series through some of the clunkier character beats and stereotypical plot contrivances. The larger mysteries of the series also pull the viewer in, because they’re legitimately abstract, and yet have large consequences for the story. It’s unclear who the aliens are or what their larger plan is—no one Will knows has ever seen one (so far as he knows, anyway), despite seeing their ships roar into and out of the sky at night. That frustrated sense of not knowing lends weight to both the anger of the resistance and the resigned inevitability, on the part of the collaborators, of things as they are. No one is really right, and no one is wholly wrong. Additionally, there are questions of a smaller scale. What kind of long-term plan does the resistance fighter have for dealing with their secret position as one of the very people that Will is hunting? How does Will hope to evade the eventual moral responsibility for his actions? With every decision, the right choice is less clear. Is it better to maintain some semblance of moral absolutism, or to get a look behind the curtain, and maybe find out who’s pulling the strings? 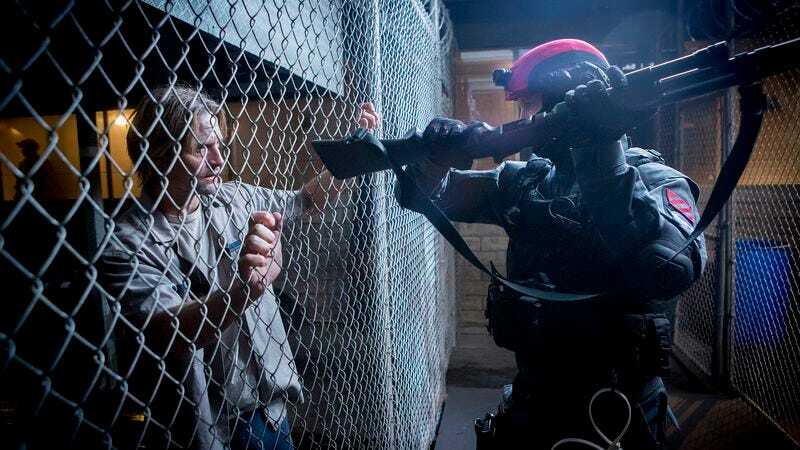 Again, these are compelling stories, not merely because they hold conceptual appeal, but because Colony executes them with fast-paced fun and breathless verve. Make no mistake: This isn’t a series to marvel at. Colony shares a commitment to thrilling intrigue and “Who can you trust?” psychological drama with USA’s most recent breakout series, Mr. Robot, but whereas that show makes the mind games brilliantly literal, Colony keeps the viewer safely within the confines of traditional perspectival narrative. It looks drab, the direction is competent but rarely inspired, and locations often come across like hastily thrown together setups. (Especially when the show ventures outside—with few exceptions, the outdoors in Colony aren’t a good place to visit.) And the characters, while largely likable, are almost uniformly underdeveloped. Outside of Will and Katie, almost everyone is a cipher, including their children and Katie’s sister (Amanda Righetti). That sister has a diabetic son—a condition that is literally his only trait. But what the series lacks in depth and visual elegance, it more than makes up for in sheer entertainment value. Colony combines the best aspects of USA’s past (generic shows that are nonetheless sugary treats) with the heady rush of its contemporary, Mr. Robot-era mission: Classing up the joint.